Reeling under the severe shock of recent defeat in three assembly polls in Hindi heartland that has left the Narendra Modi government worried about the prospects of general elections to be announced in a few weeks from now, tried to shower pre-poll sops when his stop gap finance minister Piyush Goyal presented interim budget on February 1. With a keen eye on the general election 2019, Modi government on February 1 presented a budget to woo a large section of the electorate- the farmers, unorganised workers, small scale traders, middle class and Indian businesses by offering sops. Though, it was meant to be vote on account it turned into a full-fledged budget. 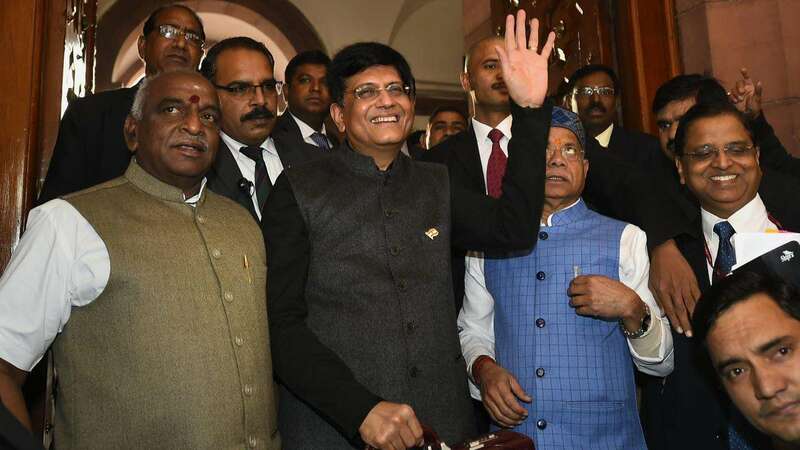 Piyush Goyal, who has become stop gap finance minister for the second time, as union finance minister Arun Jaitley is currently recuperating in New York, went ballistic turning the budget speech into an election rhetoric singing an ode to Modi-led government. Present in the Lok Sabha, Prime Minister Modi continued to thump the desk in approval of the announcements till Goyal ended his two hour long speech. India is reeling under acute farm distress. This was one of the reasons attributed for the rout of BJP in Madhya Pradesh, Rajasthan and Chhattisgarh. To arrest unrest further in rural India especially among the farming community Goyal announced the Pradhan Mantri Kisan Samman Nidhi under which farmers with less than two hectares land holding will receive INR 6,000 or USD 83.96 per year. They will receive it in three installments, to be transferred directly to farmers’ bank accounts. This estimated 120 million farmers. This is biggest highlight of the interim budget. For the first time ever the government tried to put cash in people’s pockets. Modi government had failed to introduce since it came to power in May 2014. But these cash sops have been announced in an interim budget when general elections are round the corner! Finance minister announced the launch of a new pension scheme for millions working in India’s bustling unorganised sector who continue to remain outside any social security net. A monthly pension of INR 3,000 or USD 41 will be given to unorganised workers that will possibly include tens of thousands of migrant labourers and the household help. The pension will be transferred directly to their bank accounts once they attain the age of 60. To woo a politically crucial voter base ever expanding middle class comprising salaried workers and professionals government announced tax sops including providing full tax rebate for income up to INR 500,000. This is expected to benefit thirty million tax payers. He also announced 2 pc interest subvention for Micro, Small and Medium Enterprises (MSMEs) that have taken a loan of INR 10 million. The government will make it mandatory to source 25 pc from the SME sector. Hope this will boost MSME which were most affected after the demonetization on December 8, 2016. Unveiling a comprehensive 10-dimensional vision to make India a USD 10 trillion economy by 2030, Goyal asserted that BJP will create an India where poverty, malnutrition, littering and illiteracy will be the matter of the past. India would be a modern, high growth, technology-driven, equitable and transparent society. BJP ally-Lok Janshakti party chief and union minister Ramvilas Paswan declared that the announcement has laid the foundations of for a certain NDA victory and the new government will be certainly headed by Prime Minister Narendra Modi while minister of State Civil Aviation Jayant Sinha strongly believes it will steer the BJP to victory with 400 seats. The budget was more or less a vote bank-facing exercise – an electoral pitch. Even the PM-Kisan scheme too was little-too-late for a government going into elections, given that it comes four days after Congress president Rahul Gandhi promised a minimum basic income to the country’s poor. Modi government interim budget exercise was described as ‘Sop Opera’ by many. Questioning the dole for the farmers, Gandhi wondered, “The government is giving INR 17 a day to farmers after destroying their lives in the last five years. This is an insult to everything farmers stand for.” Not only Gandhi has attacked the budget, even former finance minister Yashwant Sinha who served in the Vajpayee and Chandrasekhar government slammed it. “It is a cash-for-votes budget. It is illegal for a candidate to do it, but when the government does, it is perfectly valid. I hope the people of India will not be fooled by these last-minute gimmicks,” he tweeted. Though the interim budget could well be a political masterstroke for ruling BJP ahead of general election as it gears for the mother of all electoral battles!